microSEARCH™ is the perfect fit for enrollment management professionals who have a specific goal and a limited budget. 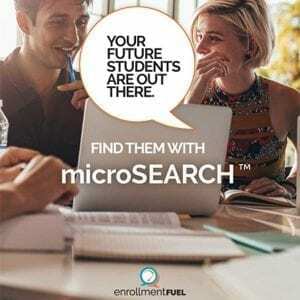 Though it is smaller in scale than traditional Student Search, your microSEARCH campaign can do big things to fill gaps and reach goals. matchBACK™ – identify and market to website visitors without cookies! Can a microSEARCH Campaign Repeat or Scale? Many microSEARCH campaigns start as single events and one-time fixes. Once an enrollment leader sees the results, they often choose to repeat the campaign or expand the scope. Coker College is a great example. They discovered a microSEARCH campaign was all they needed for a record-setting, enrollment growth year. In fact, the ability to repeat a campaign or scale to a larger audience is one of the many benefits of microSEARCH. It allows you to test ideas, determine interest, and discover what works – all within a budget.